What Kinds of Groups Work in an Escape Room? Have you been thinking about doing an escape room but, not sure if it could work with your group? 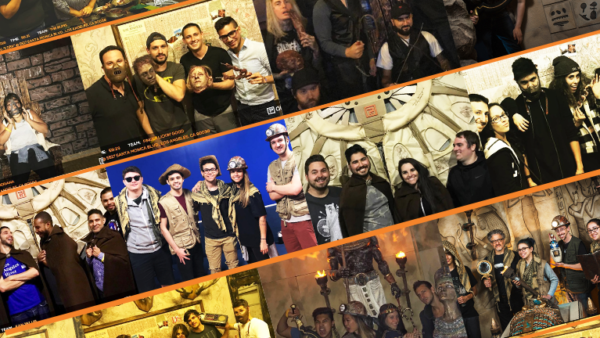 With so many escape room locations, you might be wondering which one might work best for your group. This blog entry will go over the different of types of possible groups to help you determine if it’s right for you. Escape rooms are perfect for groups of friends! It can be a fun and new experience that will allow you to create lasting memories. It’s even better to try an escape room with enthusiastic and interested friends that really get into it. To fully enjoy an escape room, it requires you to play along with the theme a little. When your group is in that same mindset, it’ll make your experience immensely better. Video gamers, board gamers, puzzle gamers, role players, etc. Since there are many different formats for escape rooms, anyone who has a love of games will definitely enjoy them! Some rooms are completely puzzle based while others are themed and immersive. In any case, escape rooms will give you the feeling of playing a competitive game while actually living the adventure with your friends. Playing an escape room is a great new way to redfine family time! 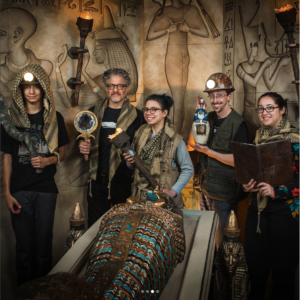 As long as you’re all on the same page of what the objective is, an escape room makes for an awesome experience with your loved ones. It combines challenging puzzles and interactive gameplay all in one intimate and memorable experience. Keep in mind, some escape rooms may contain mature themes so, it’s good to be mindful of the imagery you’ll be encountering. 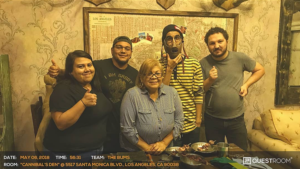 At it’s core, an escape room is all about working as a team. You’re trapped in a room, you have an objective, and you must solve it within the time allotted in order to escape. This gives everyone the opportunity to show their strengths and weaknesses and where your team can help each other out. There are many elements at play such as prioritization, time management, delegation, problem solving, communication, etc. This makes team building an ideal situation to do an escape room! Escape rooms are helping to usher in the rise of immersive entertainment. Although they initially started as just puzzle rooms, many rooms have innovated the experience. They’re becoming more immersive by incorporating rich storytelling, high production quality, and theatrical level effects. These elements allow you to experience the themed environment to feel like you’re in the story and craft your own narrative. Several rooms are also horror themed so, if you’re a fan of haunts or mazes, horror-themed escape rooms are definitely an awesome fix! Escape rooms can work for so many groups. And truthfully, anyone with an open-mind will definitely enjoy this kind of experience! At Quest Room, we currently offer 4 different rooms for all kinds of audiences. Check out our schedule here and book today!